Many passages in the Book of Mormon speak of it and other records being hidden up, often in the earth, in order to come forth to the world at a later time.1 According to John A. Tvedtnes, “The concept of hiding books for future generations to discover is [also] evident in a large number of early documents from the ancient Near East, whence came the peoples of the Book of Mormon.”2 The reports and legends contained in these documents stretch back to Adam himself. The Ketef Hinnom inscription written on a silver scroll from Israel. Mountains often symbolize temples or holy sanctuaries.19 Likely in relation with this theme, the Book of Mormon reports that several sacred revelations—including the Book of Mormon itself—were received, recorded, or buried in association with mountains or hills.20 Historical accounts indicate that many Nephite records were preserved in a hillside cave,21 and the Book of Mormon itself emphasizes that it would be “brought out of the earth” (Mormon 8:16).22 Joseph Smith said that an angel named Moroni had responsibility for the plates and led him to their buried location on a hill near his family’s farm (Joseph Smith—History 1:21–54). In light of post-1830 discoveries from all over the world, and especially from the Middle East, it can be seen that the Book of Mormon is at home in the ancient world. 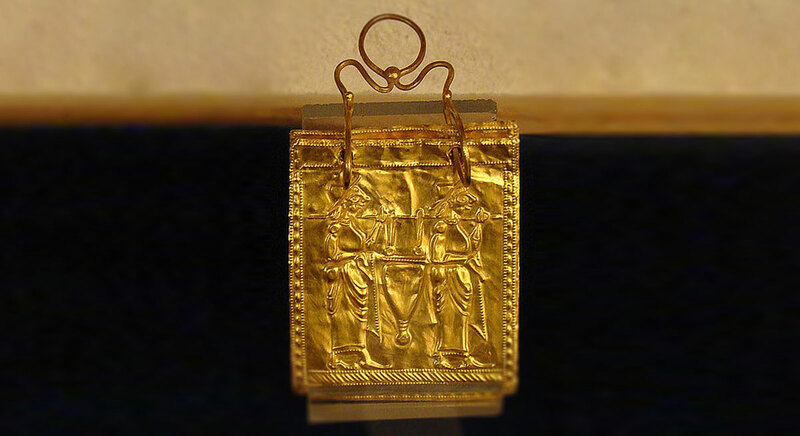 Doubled and witnessed legal documents, engraved golden plates, sealed records, stone boxes, sacred hillside repositories, caches of precious relics—all of these things are abundantly attested in antiquity, both archeologically and textually. Not only can such discoveries strengthen our faith in the Book of Mormon, but they can also help us better understand and appreciate it. For instance, in our day it takes only a few moments to digitally upload or download what would have been a virtual wagonload of documents in the ancient world! Recognizing that Nephite prophets had to find precious ore, forge their own plates, carefully engrave each character, haul the heavy plates to safe locations, and create durable containers to protect them should increase our gratitude for the sacred writings they recorded and preserved. The Book of Mormon is a testament to the faith and love of the Nephite prophets. The prophet Enos said he prayed that the Lord “would preserve a record of my people, the Nephites … that it might be brought forth at some future day” (Enos 1:13). In response, the Lord promised to fulfill this request in His “own due time” (v. 16). He also revealed to Enos that “Thy fathers have also required of me this thing; and it shall be done unto them according to their faith; for their faith was like unto thine” (v. 18). These verses show that the Book of Mormon exists today because ancient prophets were concerned for future generations whom they would never meet in mortality. They truly cared about us. In turn, we ought to deeply care about them. Only when we recognize and accept the Book of Mormon as an ancient record can we gain the fullest understanding and appreciation for its sacred messages and the prophets who wrote them. John A. Tvedtnes, The Book of Mormon and Other Hidden Books: Out of Darkness Unto Light (Provo, UT: FARMS, 2000). John W. Welch, “Doubled, Sealed, Witnessed Documents: From the Ancient World to the Book of Mormon,” in Mormons, Scripture, and the Ancient World: Studies in Honor of John L. Sorenson, ed. Davis Bitton (Provo, UT: FARMS, 1998), 391–444. H. Curtis Wright, “Ancient Burials of Metal Documents in Stone Boxes,” in By Study and Also By Faith: Essays in Honor of Hugh W. Nibley, Volume 2, ed. John M. Lundquist and Stephen D. Ricks (Salt Lake City and Provo, UT: Deseret Book and FARMS, 1990), 273–334. Paul R. Cheesman, Ancient Writing on Metal Plates: Archaeological Findings Support Mormon Claims (Bountiful, UT: Horizon, 1985). 1. See 1 Nephi 20:6; 2 Nephi 27:12, 22, 26–27; 4 Nephi 1:48–49; Mormon 1:2; 4:23; 5:8, 12; 6:6; 8:4; Ether 4:3, 13, 15; 15:11, 33. See also, Book of Mormon Central, “What Were the ‘Other Records’ Nephi Saw in Vision? (1 Nephi 13:39),” KnoWhy 376 (October 26, 2017). 2. John A. Tvedtnes, The Book of Mormon and Other Hidden Books: Out of Darkness Unto Light (Provo, UT: FARMS, 2000), 11. 3. Joseph initially wasn’t able to obtain the gold plates because his heart was not right before the Lord. After locating the record, he “tried three times to take them out of the box, but suffered progressively stronger shocks that deprived him of much of his natural strength, until he exclaimed in frustration, ‘Why can I not obtain this book?’” H. Donl Peterson, “Moroni—,” Ensign, January 1992, online at lds.org. It took four years before he was prepared to receive them. See Joseph Smith—History 1:53. 4. Tvedtnes, The Book of Mormon and Other Hidden Books, 137. 5. Tvedtnes, The Book of Mormon and Other Hidden Books, 20. 6. Tvedtnes, The Book of Mormon and Other Hidden Books, 21, 167–174. 8. a. b. See William J. Hamblin, “Metal Plates and the Book of Mormon,” in Pressing Forward with the Book of Mormon: The FARMS Updates of the 1990s, ed. John W. Welch and Melvin J. Thorne (Provo, UT: FARMS, 1999), 20. Although some examples of metal plates had been discovered by Joseph Smith’s day, it’s likely that knowledge of these discoveries was mainly held by educated scholars and not the general public. See William J. Hamblin, “An Apologist for the Critics: Brent Lee Metcalfe’s Assumptions and Methodologies,” Review of Books on the Book of Mormon 6, no. 1 (1994): 462–470. 9. See William J. Hamblin, “Sacred Writing on Metal Plates in the Ancient Mediterranean,” FARMS Review 19, no. 1 (2007): 37–54; H. Curtis Wright, “Ancient Burials of Metal Documents in Stone Boxes,” in By Study and Also By Faith: Essays in Honor of Hugh W. Nibley, Volume 2, ed. John M. Lundquist and Stephen D. Ricks (Salt Lake City and Provo, UT: Deseret Book and FARMS, 1990), 273–334; Paul R. Cheesman, Ancient Writing on Metal Plates: Archaeological Findings Support Mormon Claims (Bountiful, UT: Horizon, 1985); Paul R. Cheesman, “Ancient Writing on Metal Plates,” Ensign, October 1979, online at lds.org; H. Curtis Wright, “Metallic Documents of Antiquity,” BYU Studies Quarterly 10, no. 4 (1970) 457–477; Daniel Johnson, “Metals and Gold Plates in Mesoamerica,” BMAF presentation, 2010, online at bmaf.org; Franklin S. Harris Jr., The Book of Mormon: Message and Evidences (Salt Lake City, UT: Deseret News Press, 1953), 95–105; John A. Tvedtnes and Matthew Roper, “One Small Step,” FARMS Review 15, no. 1 (2003): 160–169; H. Curtis Wright, Modern Presentism and Ancient Metallic Epigraphy (Salt Lake City, UT: Wings of Fire Press, 2006). 10. See Tvedtnes, The Book of Mormon and Other Hidden Books, 109–126. The reason additional relics are relevant is because the plates were preserved along with the Nephite interpreters and breastplate. And when the Three Witnesses were granted a view of the plates, they also beheld other Nephite relics, including the breastplate, interpreters, liahona, and sword of Laban (see Doctrine and Covenants 17:1). 11. Tvedtnes, The Book of Mormon and Other Hidden Books, 36. 12. See Tvedtnes, The Book of Mormon and Other Hidden Books, 31–58. 13. Tvedtnes, The Book of Mormon and Other Hidden Books, 43. 14. Tvedtnes, The Book of Mormon and Other Hidden Books, 44. 15. Tvedtnes, The Book of Mormon and Other Hidden Books, 36. 16. See Title Page; 2 Nephi 26:17; 27:7–21; 30:3; Ether 3:27; 4:5; 5:1; Moroni 10:2. 17. See John W. Welch, “Doubled, Sealed, Witnessed Documents: From the Ancient World to the Book of Mormon,” in Mormons, Scripture, and the Ancient World: Studies in Honor of John L. Sorenson, ed. Davis Bitton (Provo, UT: FARMS, 1998), 391–444; John W. Welch and Kelsey D. Lambert, “Two Ancient Roman Plates,” BYU Studies 45, no. 2 (2006): 55–76. 18. See Book of Mormon Central, “Why Would a Book Be Sealed? (2 Nephi 27:10),” KnoWhy 53 (March 14, 2016). 19. See 2 Nephi 12:2–3; cf. Isaiah 2:2–3. 20. See 1 Nephi 11:1; 1 Nephi 18:3; 2 Nephi 4:25; Mormon 1:3; Mormon 4:23; Mormon 6:6; Ether 4:1; Ether 15:11. 21. A number of individuals claimed that Joseph Smith and Oliver Cowdery visited a cave that was filled with Nephite records and artifacts. However, it is difficult to tell, from these reports, whether the experience was in vision or whether they visited the cave in person. See Cameron J. Packer, “Cumorah’s Cave,” Journal of Book of Mormon Studies 13, no. 1–2 (2004): 50–57, 170–71. 23. Tvedtnes, The Book of Mormon and Other Hidden Books, 129. 24. Tvedtnes, The Book of Mormon and Other Hidden Books, 129. 25. Tvedtnes, The Book of Mormon and Other Hidden Books, 75–108. 26. See Diane E. Wirth, “Revisiting the Seven Lineages of the Book of Mormon and the Seven Tribes of Mesoamerica,” BYU Studies Quarterly 52, no. 4 (2013): 77–88. 27. Holley Moyes and James E. Brady, “The Heart of Creation, the Heart of Darkness: Sacred Caves in Mesoamerica,” Expedition 47, no. 3 (2005): 31. See also Holley Moyes, ed., Sacred Darkness: A Global Perspective on the Ritual Use of Caves (Boulder, CO: University Press of Colorado, 2012). 28. Most notably, the Book of Mormon emphasizes that “great and marvelous were the prophecies of Ether” who “dwelt in the cavity of a rock [as] he made the remainder of this record” (Ether 13:13–14).